It was rain rather than goals hailing down at the RSC as Bohemians eked out a draw to remain in top spot. These two sides had scored in their last 27 games, yet last night they were solid at the back and toothless in attack. 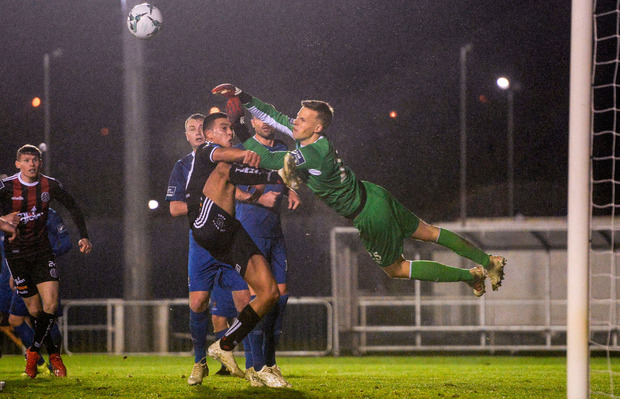 Bohs, one of only three part-time teams in the 10-club Premier Division, have been the success story of the season so far, this stalemate following three wins on the trot. At least their goalkeeper James Talbot was a happy man to extend his record to 360 minutes of action this term without conceding. Unlike his opposite number Keith Long, who has started only 13 players to date, Waterford boss Alan Reynolds is still settling in his best team. Last night, three players coming in for their full debuts brought his tally to 17 starters, including two goalkeepers. Finnish stopper Hugo Keto got the nod between the sticks. He arrived at the RSC three weeks ago on loan from Brighton, having spent four years at Arsenal. Bohs were content to operate on the counter and they conjured their best opening after half an hour. Ali Reghba, on the pitch just two minutes to replace the injured Luke Wade-Slater, was released on goal by Dinny Corcoran, yet could only slice his low effort into the side-netting. Former Bohs striker Izzy Akinade was an isolated figure up front for Waterford. The most Alan Reynolds' side could muster was Zack Elbouzedi's speculative shot from 25 yards which zipped wide. The Blues continued the tactic of adopting a high defensive line and the risk caught them out again five minutes after the restart. Early-season surges have proven Daniel Mandroiu has pace to burn and he showed Kenny Browne a clean pair of heels in a foot-race from the halfway line. Fortunately for the local veteran, the nimbler Keto advanced to smother the danger at Mandroiu's feet. At the other end, the Déise were getting most joy from corner-kicks. Browne was left unmarked to connect with Georgie Poyton's delivery and his half-volley drew a close-range save from Talbot. The former Sunderland trainee once again displayed his reflexes with 18 minutes left. Another defender, Rory Feely, rose to get his header on target but was denied by the stopper's tip-over. WATERFORD – H Keta; G Poynton, K Browne, D Delaney, R Feely; S Duggan, JJ Lunney; Z Elbouzedi, B Héry (K Chvedukas 70), C Galvin (S Twine 46); I Akinade (A Drinan 79). BOHEMIANS – J Talbot; D Pender, R Cornwall, J Finnerty D Leahy; L Wade-Slater (A Reghba 28), K Buckley; C Levingston, D Mandroiu, K Ward (R Swan 76); D Corcoran.